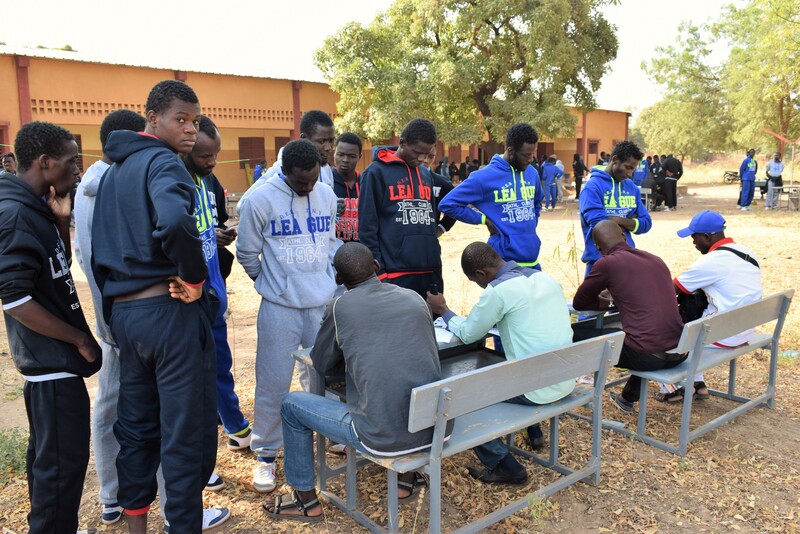 Ouagadougou - IOM, the UN Migration Agency this week (9/11 and 14/11) assisted 135 Burkinabe migrants to return home from Libya under the EU-IOM Joint Initiative for Migrant Protection and Reintegration, funded by the EU Emergency Trust Fund for Africa. The two flights chartered by IOM touched down on November 9, and November 14, 2017 at the International Airport of Ouagadougou. Onboard, most of the returnees were young men, completely exhausted by their journey but also relieved to return home. Their return was organized by the Burkina Faso Ministry of Women, National Solidarity and Family in collaboration with IOM and the Ministry of Foreign Affairs. Many returnees told IOM staff that they had expectations to reach Europe from Libya, a transit point to cross the Mediterranean. “I wanted to reach Europe and hoped to earn something to lift my family out of poverty. I travelled via Agadez in Niger and crossed the desert to enter Libya. I spent eight months in Libya, including seven months in detention. It was a real nightmare. Now I am grateful for the support to start-up my life again in Burkina Faso. I came back without luggage and lost a lot of money”, said Dembélé Moustapha, one of the young migrants who returned from Libya. Upon their arrival in Ouagadougou the migrants were welcomed by Fati Ouedraogo, the Secretary General of Ministry of Women, National Solidarity and IOM team with its partners. “We saw them [the returnees] arriving in terrible conditions. Some are very sick and all very weak. As a mother, I am completely shocked to know that young men, the future of our country, have put themselves in such difficulty by travelling through the desert and crossing the sea in dangerous conditions” said Ouedraogo. “We appreciate and encourage IOM to strongly support us with the assistance to vulnerable returnees. For those who are tempted by such an irregular travel to Europe, I can only say to you that they will earn more by working here in Burkina Faso than by this type of attempts to reach a non-existing El Dorado,” she concluded. Returning migrants were given immediate support by IOM and partners, including temporary accommodation in a transit center where they could rest and eat. They received a kit containing toiletries and support to travel the day after to their final destinations. A team composed of Red Cross volunteers, representatives from civil society and a CONASUR (Conseil National de Secours d'Urgence et de Réhabilitation) representative offered counseling, urgent medical care and psychosocial assistance. Four returnee in a particularly vulnerable situation were transferred to a hospital for close medical follow-up. All migrants were registered and profiled to get a deeper insight in the dynamics behind their irregular migration. Through the EU-IOM Joint initiative for Migration Protection and Reintegration in Africa, returnees will be provided with reintegration assistance based on their needs. IOM and partners will support returnees with orientation towards innovative income-generating activities which have a socio-economic impact on their community of origin. IOM monitors the reintegration activities closely and will open very soon an office in the Center-East region of the country, an area where many of the returnees go back to. This year, IOM has supported 669 Burkinabe migrants to return from Libya. *The names of the migrants have been changed to protect their privacy.